Using the right industrial mops and other facility cleaning products is essential for keeping labor costs down and for maintaining a healthy, attractive workplace. UniFirst offers latest-generation industrial dry and wet mops, as well as technologically advanced microfiber floor mops (and wiping products), to provide the most effective floor cleaning tools that help improve cleaning effectiveness and lower maintenance costs. UniMop® dust mops and wet mops from UniFirst pick up more soiling and liquids, with less effort, than traditional cotton floor mops. Our dust mops feature patented, 100% synthetic yarns in a unique twisted profile to collect and hold dust better than competitive mops. Our patented wet mops also feature 100% synthetic yarns, and they're designed for super absorption and to suppress the growth of odor-causing bacteria. Our advanced microfiber mops (and wipers) are constructed of dense microscopic polyester and polyamide (nylon) fibers about 1/16 the thickness of a human hair. The results? Cleaning products that can absorb up to six times their weight in water, and pick up and hold dust like a magnet. UniFirst microfiber cleaning products are revolutionizing the way most hard, smooth floor surfaces are cleaned. With regularly scheduled floor mop rental services from UniFirst, all of your soiled floor mops are regularly picked up for hygienic laundering and professionally clean ones are delivered in their place. We maintain your specified inventory and replace all worn-out items automatically. So you always have the required number of floor mops on hand when you need them. 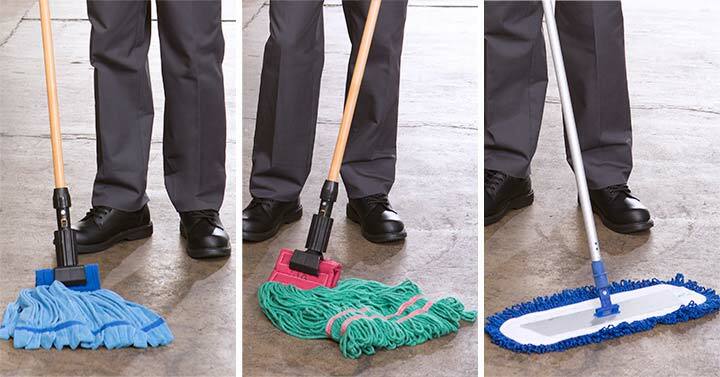 We offer a complete line of commercial mops and services including microfiber mops, wet mops, and dry mops.